Folks are always asking me to choose a favorite Bay Area hike. I never can, but I do have a mental list of my personal premium parks and preserves. In summer my top choices shrink considerably since I don't like to hike in hot weather. 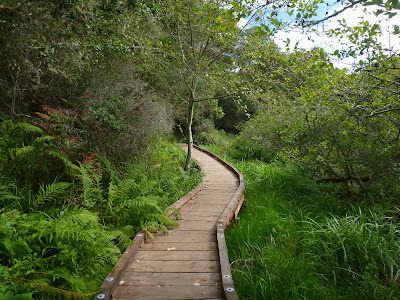 Tomales Bay State Park remains on my short list all year; I actually prefer it when the rest of the Bay Area is baking. Very few other destinations can match Tomales Bay's summer beauty. The woods are lush with ferns, evergreen trees, and shrubs. Huckleberry bushes are stocked with ripe blue berries. Leafy hazelnut shrubs tower above the trail. Salal forms dense hedges. 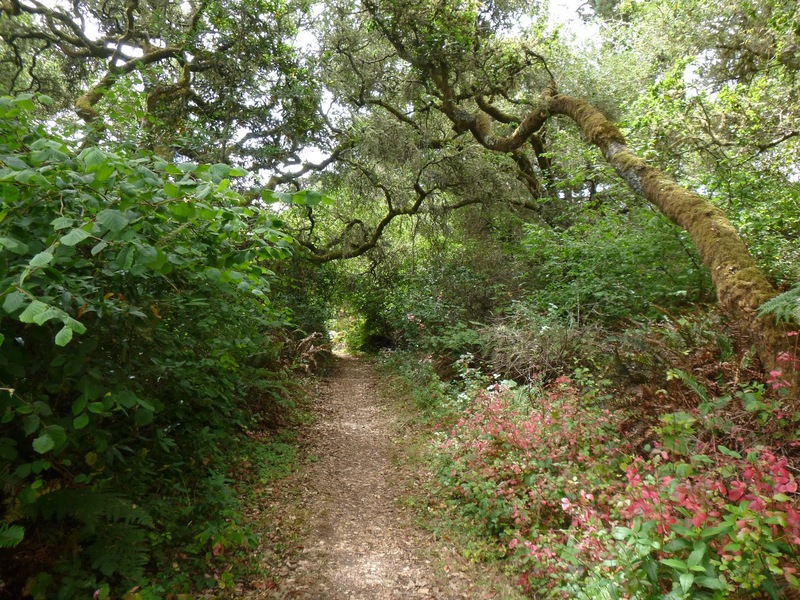 Huge coast live oaks sprawl overhead, mixed through pines, madrones, tanoaks, and chinquapins. Paths wind through woods and lead to Tomales Bay, a calm, placid (and relatively warm) body of water perfect for a mid-hike swim. It is a sublime destination to walk, breathe in the sweet-scented air, and relax in the moment. Of course, you shouldn't only visit Tomales Bay in the summer. Now that the soggiest stretches of Johnstone Trail have expertly-built elevated walkways, the loop is a pleasure in winter and spring, when iris brighten the woods and mushrooms pop up everywhere. With few deciduous trees, autumn is a bit tame but still pleasant. On Monday my son and I greatly enjoyed our standard 3 mile Tomales Bay loop. We started at the parking pullout on Pierce Point Road and trekked down Jepson Trail to Johnstone Trail. Along the paths huckleberries were at their peak of ripeness. The woods were absolutely silent, but for an occasional breeze whispering through the trees. We paused at Pebble Beach so my son could swim in Tomales Bay, then continued our loop, passing through the parking lot (empty) and uphill on Jepson Trail. Thimbleberries, gooseberries, salal, and huckleberry all gave us excuses to stop and catch our breaths from time to time. Back at the trailhead we realized we had crossed paths with no other humans. See you next summer Tomales Bay!